If you don’t have a written contract between your company and your customer, you may be opening yourself up to problems and quibbles which could easily be avoided. A verbal agreement can work in some situations, however having your terms of business written in a black and white contract and signed by both yourself and your customer is highly recommended. 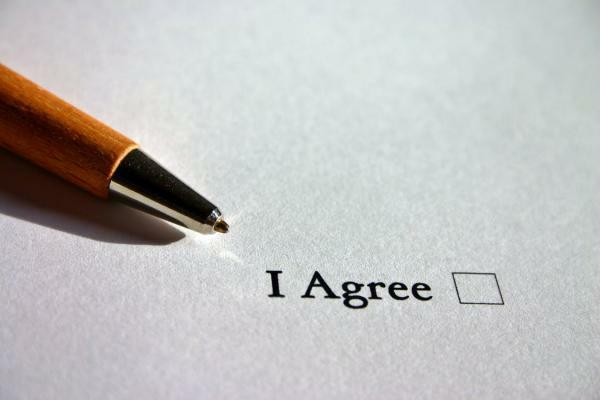 A contract simply spells out what you are offering and what your customer is doing in return. This could be providing a product in return for a payment. Or it could be supplying a service in return for a payment. I specialise in creating bespoke contracts for individuals and businesses and your tailored contract can have additional clauses, such as whether the payments are one-off, up front, or subscription based. There can be clauses for loss of items during delivery, or a service level guarantee. There can also be termination and cancellation clauses which protect both your company and your customer. One of my clients, Jo Howarth from The Happiness Club, contacted me to create her a bespoke contract for her business. She runs workshops for businesses and speaks at events and her customers book her services in person, by telephone, by email and online. However, at the time, Jo wasn’t using a contract and if someone wanted to change the date for a booking or cancel an event, she didn’t have the paperwork in place to charge a deposit or say that the payment still needed to be made. This meant the time the customer had booked needed to either be re-sold or it became lost time and lost revenue. You can watch Jo Howarth’s video on YouTube (https://www.youtube.com/watch?v=fOgxeWHsnTY) where she discusses the problems of not having a contract. Jo also explains how we have worked together to create something which she describes as “solid and secure” which has “saved money, saved time and saved any quibbling when someone changes the date or cancels a booking”. If I can help write a bespoke contract for your company covering your products and services then please contact me and I will be happy to help. I work with companies in many different industries and understand the different clauses which will be important to you to include. Please get in touch on 07756 772950 or by emailing rachael@rachaelchiverton.co.uk.